We’ve been building high quality harness and container systems for over 20 years. We look forward to building your next rig. The rig that made Mirage famous. Developed specifically for wingsuit base. Highly advanced technology for your students. You can design your own custom color pattern or choose a stock rig for faster delivery. 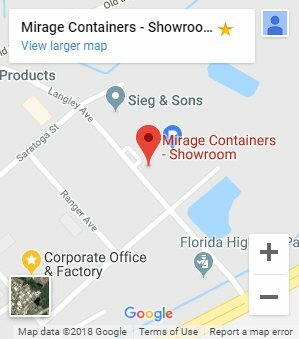 Use our Container Sizing Guide to determine the correct Mirage for your canopies. Stock & custom parts can be ordered by filling out the appropriate order forms below. We try to keep most standard items in stock. 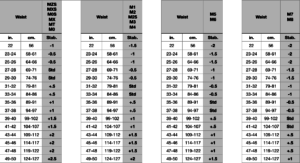 Harness Sizing CalculatorStep-by-step measuring instructions. Container Sizing GuideCanopy compatibility chart and guidelines. 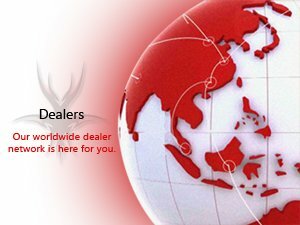 Dealer : Sport ContainersOur Worldwide Dealer Network is here for you. 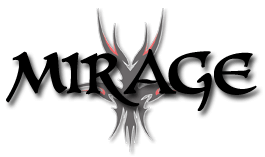 Mirage AthletesCheck out our blog dedicated to our Mirage Athletes. This is a new container with an unfinished harness. We will complete the harness to your measurements. The price of this container includes the options it is already configured with as listed below. These options cannot be removed, but you can make some changes. This form will walk you through the available configuration choices and costs. * If you like the colors of this container, but it is not the correct size or you would like different options, we can build you a custom container to your specifications. Make a note of the SKU # for reference. The Yoke and Stabilizers (waist) are already completed on this container. See the product specs tab below. We will build the Main Lift Web and Leg Pads to your measurements. If you are copying a previous rig, be sure to give us the serial number or container size in the additional notes. 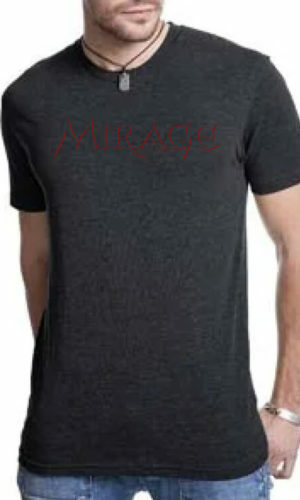 If there is a Mirage that fits you well or that you would like us to use for reference, list its serial # here. How Did This Rig Fit You? It is helpful, but not required, if you can include a photo of the label. Ladies, we need your cup size for the yoke & chest strap. Look in the mirror and don’t be surprised if your legs are slightly long or short; most people are not perfectly proportionate. It is very difficult to measure yourself accurately, so you will need someone to assist. Try not to skip any measurements. • Measure both left and right as a double check. • Measure from the BOTTOM of the hole at the base of your throat, diagonally over your chest, to the very TOP of your hip bone AT YOUR SIDE. • The top of the hip bone is approximately the same height off the ground as your belly button. 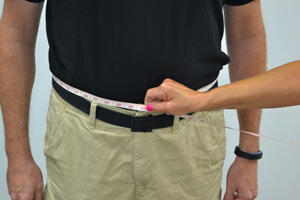 • Common mistakes are measuring too low on the hip (too long), or not enough to the outside (too short). • A typical measurement would be between 15” (38 cm) and 20” (51cm), with the average being 16-18” (40-45 cm). • Measure from the base of the throat (same starting point as the Torso measurement), down through the crotch and up your back to the base of the collar (protruding spine bone on the back of the neck). Tape should be snug, but not painful. We will adjust the main lift web slightly for your fit preference. A little snug = -.5"
A little loose = +.5"
• Take EVERYTHING OUT OF YOUR POCKETS. 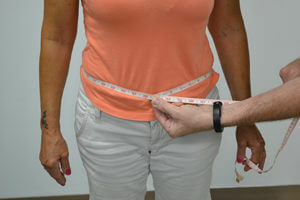 • Measure around the leg, as the leg strap travels, up to the SIDE of your hip bone. This is usually where your belt is. • Be sure to pull the tape SNUG. • The measurement should be in the range of 28” – 34” for most people. 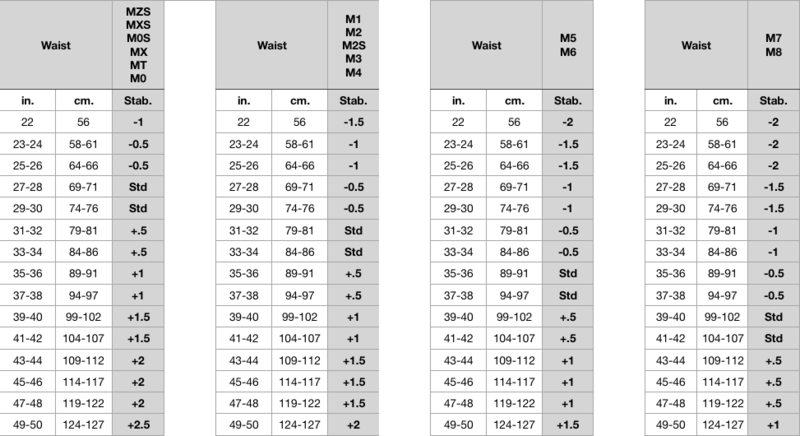 • Leg pad length preference varies from person to person. Some people like their pads to overlap, some like the ends to just touch, and others like a few inches of gap. All of these are safe as long as you are sitting on the pad and your strap feeds through with at least 5-6 inches of tail. Tip: Make sure your leg straps are high and tight when exiting the aircraft. Movement of leg straps during deployment can cause bruising – remember your student gear? The stabilizers are already completed on this container. This is a quick reference chart. If you'd like us to double check your stabilizer sizing, enter your info below. 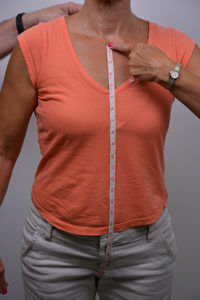 • Measure around your waist at your belly button. This is usually larger than your pant size. • Do not pull your stomach in. Be certain the tape is level. • Stabilizers are sized in half inch increments: +1.5, +1, +.5, std, -.5, -1. You can usually go up or down one size based on your comfort preference, but not more. 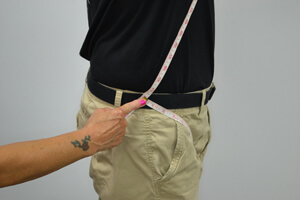 Each increment is similar to loosening or tightening your belt one notch. 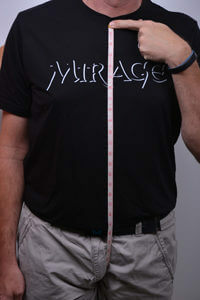 TIP: The Mirage lumbar support elastic is only for comfort. If you would like your rig to fit tighter against your back we recommend using our small sit fly belly band. It attaches to your hip rings and can fit in your back pocket when not being used. We also offer a larger belly band for swooping. The yoke is already completed on this container. This is a quick reference chart. If you'd like us to double check your yoke sizing, enter your info below. • Let us know if you have thick shoulders. This is used to assist in determining yoke extensions. 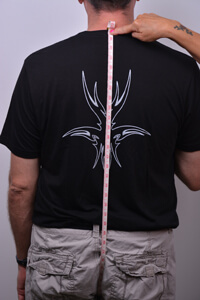 • If you have thick shoulders we should double check your sizing. • Select only if applicable / desired. • +1 or -1 yoke extension means that the distance from the top of the rig to the 3 rings (over the shoulder) was adjusted by 1 inch. If you need a yoke extension but don’t have one, the rig will feel tight in the shoulders. We’re happy to help make your rig fit. NOTE: We need to see how long your body is compared to your legs and how thick you are, so please don’t wear jackets, long shirts or baggy pants. This container has the Unisyn Harness. Hip & Chest Rings : Most of the rigs that we build have the Unisyn Hip & Chest Ring Harness. 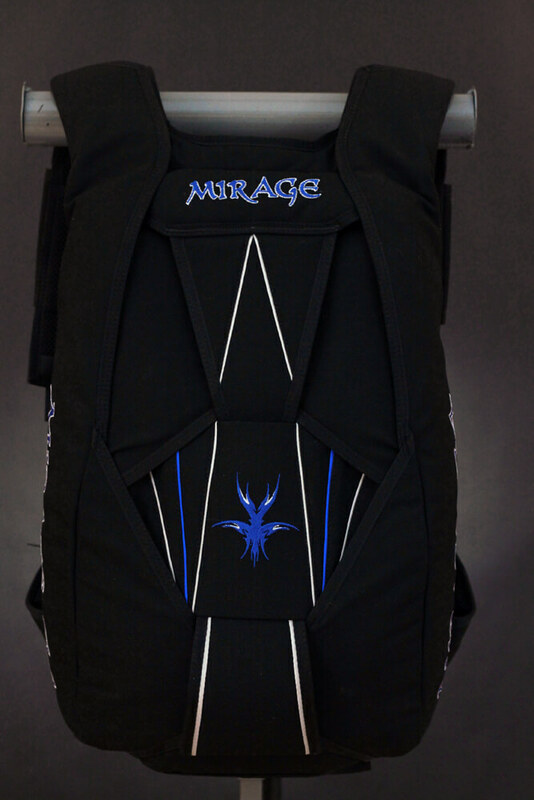 It includes the Mirage 1-Piece Leg Pads that are known for their comfort under canopy. It has the best re-sale value since it is our most popular harness. This harness is also the least expensive to have adjusted. Hips Rings : The Unisyn Hip Rings Harness is the same as the Unisyn except that it does not have chest rings. 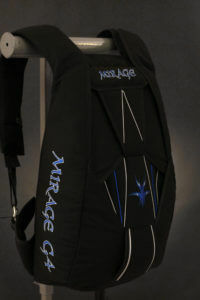 It still has the Mirage 1-Piece Leg Pads. This harness has less flexibility at the top of the harness. Be aware that this harness is more expensive to have adjusted than the Unisyn with chest rings. 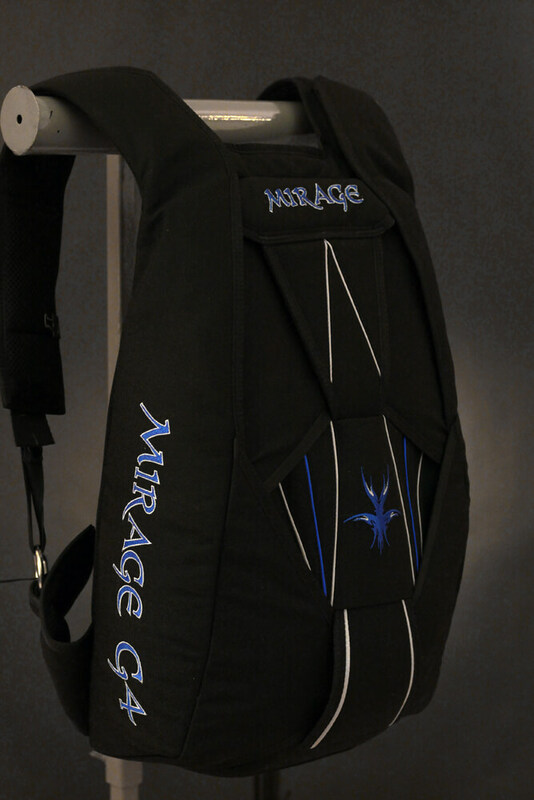 * Stainless steel hardware is standard on all Mirage harnesses. Type 8 is recommended at 225 lbs (exit weight). Type 8 is required at 250 lbs (exit weight). Our standard length is 20". Most people use this size. If you have shorter arms you may prefer -2"
If you have longer arms you may prefer +2"
Soft: The soft swoop loops add a little stiffness to the loop, but not enough to stay open when you take your hands out. Medium: The medium swoop loops are our most popular; they stay open and also pack flat. XFirm: The x-firm swoop loops do not lay flat when packing; your riser covers will bulge when closed. These loops are intended for hop & pop swooping. Large: The large swoop loops will fit larger hands or thick gloves. They pack flat. Some colors are limited - they will be removed from the list when not in stock. Only suggested for competition swooping. The standard Mirage chest strap is approximately 20"
If you know you like a longer chest strap but don't know how, much then choose +8 inches. This container has the contoured leg pads option. The contoured leg pads are double wide in the saddle, making them more comfortable under canopy. Only available on Unisyn harnesses. This container has the Trap System. Red is our standard color and quickest delivery time. This container has the soft ripcord option. You can switch it to metal if you prefer. Black is our standard color and quickest delivery time. 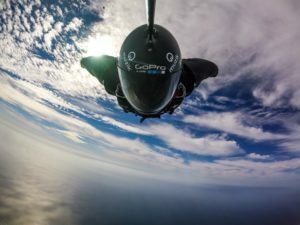 Semi-open bottom corners for better wing suit deployments. If you plan to start wingsuiting in the future, you can wait and have us do this modification later. 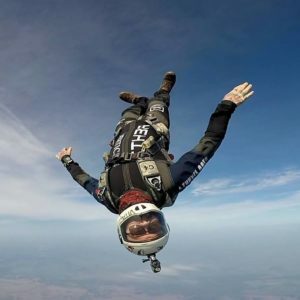 It is easy for us to do and it is better to have standard corners if you are not wingsuiting. This container has the secondary closing loop option. Located in bottom of main pack tray in addition to primary loop location on bottom flap, allowing the user to choose. This container has a collapsible main pilot chute. Main PC's are made with F-111 per most canopy manufacturer's recommendation. ZP is available if requested, in limited colors, for an additional charge. Longer bridle lengths are for wingsuiting. If you’d like a solid color hacky, make the 2nd color the same as the 1st color. Embroidery may add slightly to the delivery time. 10 characters maximum, including spaces & punctuation, in a single line. If you have a digitized file that an embroidery machine can read (.dst), attach it here now or send it to us later at sales@miragesys.com. If you do not already have the picture you want embroidered in a .dst format, send us as high of resolution photo as possible (.jpg .pdf or .png) and we will have it digitized. There is a digitization fee based on the stitch count of the artwork. You will be advised of the fee prior to production. 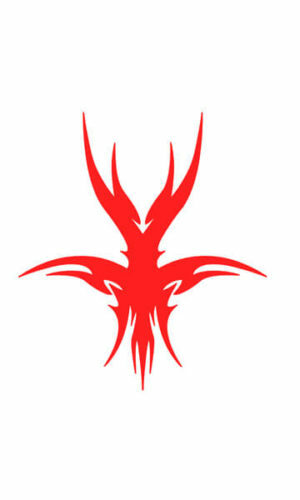 A phantom is the Alien outline with no fill. You can press submit. This item will not be sent to production and your payment will not be processed until your questions are addressed. Our stock delivery time is usually 2 weeks from when the order form is complete. Selection of custom embroidery and non standard parts can affect this. If you need it faster or if you need a guaranteed ship date, give us your time frame and we will let you know what our current rush service pricing and availability is.